If you know any Sri Lankans and have been to their home for a traditionally meal–or have, like, come to their door to deliver a parcel–you’ve likely been offered a “short-eat”. As the name suggests, it’s just a “bite” but the terms is reserved for a snack that is much more than a slice of bread or cookie. Short eats, like vadais, take preparation, are often baked or fried, and are complex in flavour. 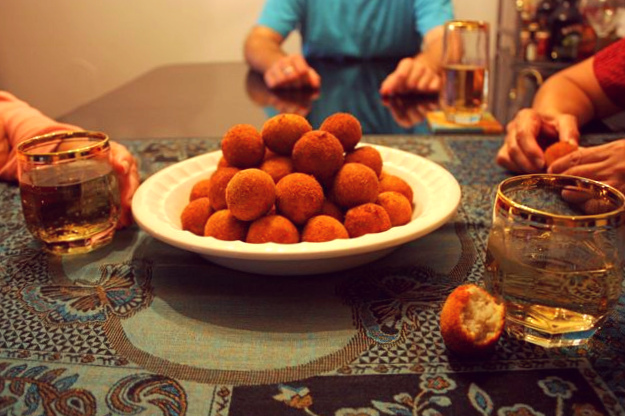 It’s likely that everyone has their favourite, but across the board in my family, young, old–even my pickiest cousin–no one can resist “cutlets”. The name cutlet, though it seems broad, refers to exactly to the spherical filling of mashed potato, fish and spices that is breaded and fried. They are bite-sized and though anyone who has had one probably forces themselves to prolong each over three or four bites. Even at that rate, it’s a challenge to stop yourself from consuming less than ten and despite how many have been made, platters full, you.will.run.out. Everyone will be left wanting more, siblings will accuse each other of having had “way more than me”, cousins will enlist younger cousins to go on a secret run to the table to traffic more back to them. When I became vegetarian, I missed having cutlets for years. I watched them being plucked from their crispy, deeply golden brown, pyramid one by one and though I feasted on many other delicious things to be sure, I was overjoyed when my loving aunt came up with a meat-free version just for me! Jackfruit was an obvious replacement for meat in dishes but only she thought it could be a sub-in for pale, flaky fish in cutlets. It was such a fantastic substitution, in fact, that I genuinely prefer these now, to the tuna variety she still makes (I have started to eat a little meat and did a side by side comparison when testing this recipe with her). Traditional cutlet recipes abound but here is the best vegetarian version out there, I promise, and they will appeal to every taste at your table–I can probably promise you that too. These cutlets are my aunt’s meat-free take on the Sri Lankan “short-eat” specialty, which is normally made with tinned tuna or salmon. They keep well in the freezer and can be reheated in a low oven or toaster-oven. *While a double-breading gives you a substantial, crispy crunchy exterior, a single-breading is fine if you are short on time. Pulse jackfruit in a food processor until it is broken up into fine pieces but do not puree. Heat oil in skillet or pan over medium heat and add then add the rampe, curry leaves, cinnamon and onion. Stir-fry until the onions start to soften and turn translucent, about 3 minutes. Add the chili, garlic, ginger and the two spices and stir well to mix. Then add the jackfruit, season everything well with salt and pepper, stir and cook for 3 more minutes. Then let cool slightly and then remove and discard rampe, curry leaves and cinnamon. Transfer mixture to a bowl. 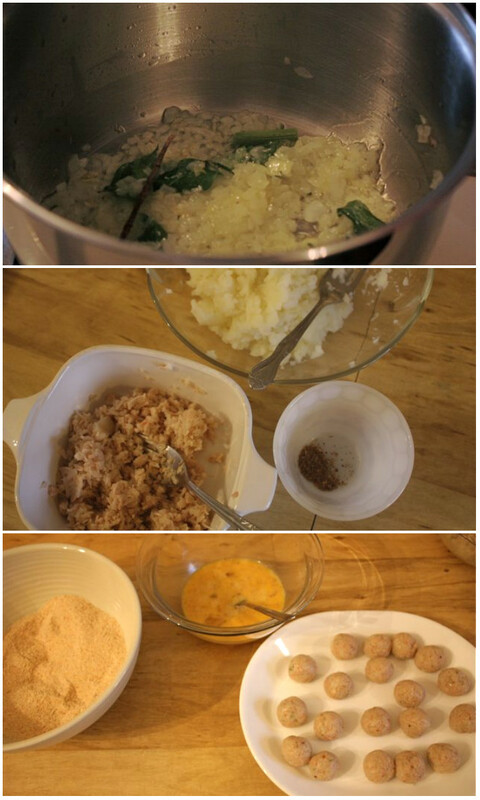 Combine mixture with mashed potatoes, add lime juice and taste and adjust seasoning. Set up your breading station. Season the breadcrumbs with the cayenne pepper, mix well and place in one wide, shallow bowl. Break eggs into another wide, shallow bowl and whisk well. Take 1 tbs of the mixture and with clean hands (slightly wet can help), roll into a smooth, tight ball. If you are working alone, it’s best to roll all of the balls first and place them on a parchment-lined plate or baking tray, making sure they don’t touch much. 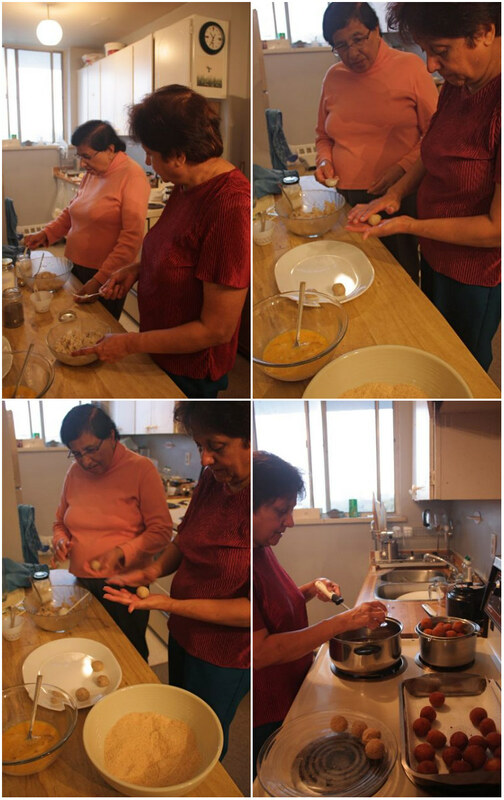 If you are working with a partner and can have a little assembly line going, you can place the rolled balls directly into the egg mixture and have the person working the breading station bread the cutlets. To bread: Have no more than 3-4 balls of mixture in bowls at any time, unless they are very large, wide bowls. With your wet hand, roll the balled filling around to coat evenly but thinly with egg and then lift it and let it drip before transferring to the breadcrumb bowl, being careful not to carry any egg over. With your other, dry hand, pile the breadcrumbs over the ball before touching it with that hand, then pick it up, shake off excess crumbs and place it gently back into the egg bowl for a double-breading. * Try to scoop egg over the breaded ball before touching it with your wet hand, then carefully transfer back to the breadcrumbs for a final coat. Place fully coated cutlets on a plate and continue to bread them all. Heat about 1-inch of oil in a heavy-bottomed, high-sided pan or pot over medium-high heat. When the oil has reached 365F degrees or breadcrumbs dance and turn golden quickly when sprinkled in, place a cutlet carefully into the oil using a slotted metal spoon or spider. (Always be very safe when frying: do not turn your attention away for a second without removing the oil from fire to a safe place and turning off the heat. Judge how high the oil bubbles up the side of the pan and only place as much food in the oil as is safe to keep the oil well-contained.) Turn the cutlet in the oil after the underside is a deep, golden brown and then fry the other side–each side should take about 30 seconds. If your cutlet browns to a very dark colour or burns, you may need to drop your heat slightly. Once you’ve gauged the heat, continue to fry batches of about 5 cutlets at a time and transfer fried cutlets to a paper-lined plate. Cool for at least a couple of minutes and serve hot or at room temperature. Makes 30, enough to serve 8-10 as a cocktail bite. And who exactly would that pickiest cousin be Yas?